Intermediate examination or its equivalent with optional subjects of Botany, Zoology, Physics and Chemistry. Or Vocational Physiotherapy with bridge course of biological and physical sciences. The minimum age for admission shall be 17 years completed and should not be more than 25 years as on 31st December, 2017.
he selection of the candidates for the admission into BPT Course is based on merit arrived out of total marks obtained in the qualifying examination i.e., Intermediate Bi.P.C. or equivalent course from the academic year 2017-18 and there will be no entrance (NIMSET)examination for the above mentioned course. 1. Selection will be made based on the merit arrived out of total marks obtained in the qualifying examination i.e., Intermediate ( Bi.P.C.) or equivalent. 2. Candidates shall be ranked in the order of merit based on the aggregate marks obtained in the qualifying examination. In case of tie, marks obtained in Zoology, in case of further tie, marks obtained in Botany, further tie, marks obtained in Chemistry, further tie, marks obtained in Physics in the qualifying examination shall be taken into consideration. 3. 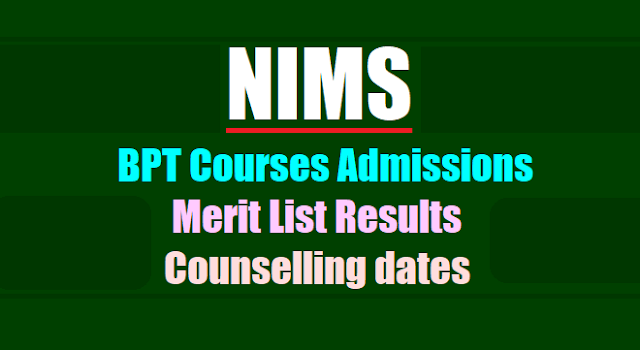 The merit list of the eligible candidates will be displayed at NIMS website: www.nims.edu.in and notice board on the dates notified in prospectus. No individual correspondence will be made in this regard. 4. Counselling letters will be sent to the candidates through e‐mail or will be issued in person. 5. The candidates called for the counselling shall come prepared to overstay for one more day beyond the date of counselling in case it is required. 7. The selection shall be based on the merit in the Intermediate examination. The statutory reservation rules and University Area Reservations as per Annexure IV of GOP No. 646 dated 10th July, 1979 of Andhra Pradesh Educational Institutions (Regulation of Admissions) Order 1974 will be followed during counselling. Candidates have to report for counselling in person at the date and time specified with a counselling fee of Rs.25,000/‐ (Rupees twenty five thousand only) and should sign in the attendance register within the stipulated time failing which he/she shall not be permitted to attend counselling and forfeits the right to admission and the seat shall be offered to the next candidate in the merit list. No request for postponing the date of counseling or request to appear at an earlier date shall be entertained. The candidates recommended for provisional admission are required to pay an amount of Rs.25,000/‐ (Rupees twenty five thousand only) towards counseling fee immediately. This amount will be adjusted against the admission fee to be paid along with the balance of fee to be collected at the time of admission. The counseling fee will be refunded to the candidates who are medically unfit at the time of Admission. In case the candidate does not, for any reason, report for admission within the specified period, the counselling fee will be forfeited. 8. The candidates belongs to SC/ST whose parents/guardian income is less than Rs.1,00,000/‐ (Rupees one lakh only) per annum are not required to pay non‐refundable (tuition) fee at the time of admission. However, the candidate is required to submit an undertaking/bond (non‐judicial stamped paper of Rs.100/‐) as per format prescribed at Annexure V that they shall pay the prescribed fee for their respective courses before completion of each year (I/II/III and IV years), if they fails to get sanction of scholarship from the respective government departments. The fee towards other heads amounting to Rs.4,050/‐ (Rupees Four thousand and fifty only) excluding tuition fee shall be paid at the time of counselling. It is mandatory to submit “either of parents/guardian” income certificate in original for the academic year 2017 issued by not below the rank of Tahsildar/Mandal Revenue Officer at the time of counselling failing which the candidate is required to pay the fee as prescribed at para 7. 9. For in‐service candidates who are pursuing studies and who cannot deposit the original certificates at the time of admission have to bring Xerox copies of the original certificates duly attested by the controlling authorities of the institution. They shall also produce a certificate from the institution that they have no objection to the candidate’s admission to the BPT course and in the event of selection of the candidate to the course he/she shall be relieved immediately. Failure to submit the above certificates shall render the candidate ineligible for admission. The filled in application forms shall be submitted along with Demand Draft in favour of Director, NIMS or NIMS cash receipt and supporting documents as detailed in prospectus (Annexure I) in person or by post (preferably by India Post services) so as to reach the Associate Dean, Academic-2, 2"d floor, Old OPD Block, NIMS, Punjagutta, Hyderabad-500 082, Telangana before 5.00 PM of 29-07-2017.